The “new boho” is here, and it’s time to disregard all your previous notions about bohemian chic styles. The new boho is all about making bohemian-inspired styles wearable for your everyday life. Pairing bold, eclectic prints with classic silhouettes and giving structured pieces touches of exotic flair with beaded and dangling embellishments, they shouldn’t just be restricted to “vacation wardrobe”. Be sure to make a statement in the Mia Limited Edition Olympus heel, Pair yours with anything from a feminine bohemian dress to boyfriend jeans and a crisp white top. 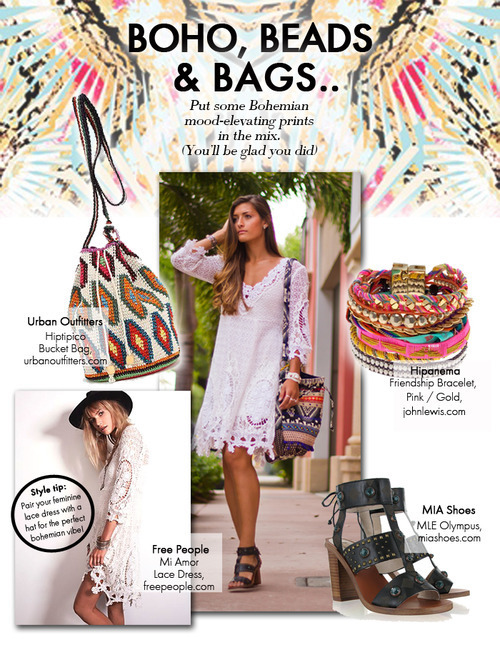 Another hot trend for Spring is the craze for bohemian bags. These embellished handbags will instantly perk up any ensemble with their hippie-meets-tribal aesthetic.